The Flash Destroyer, our new EEPROM tester, is going to reach the first million write cycles in the next few hours (see a live stream here). Can you guess what the final write count will be when the EEPROM dies? We’ll give a couple unpublished Dangerous Prototypes PCBs to the three closest guesses. 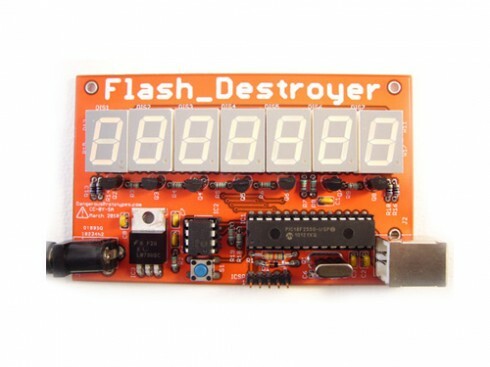 You can preorder the Flash Destroyer ‘I like to solder’ kit for $30, including worldwide shipping. This entry was posted on Wednesday, May 26th, 2010 at 4:49 pm	and is filed under Flash Destroyer. You can follow any responses to this entry through the RSS 2.0 feed. You can skip to the end and leave a response. Pinging is currently not allowed. hmmm, what about… 1234567 wryte cycles? Can it count past 10M-1? I second that, the temperature’s just not high enough. My guess: 9 999 999 cycles! Actually I think I want to change that to about 13 million, the temperature is really low so will extend the amount of cycles. will it roll over and keep going or stop at 9999999? It will keep going. The internal counter is 32bits, so it can count a lot higher than that, but the display will only show the LSB. I’m working on an update now in anticipation of reaching 10M – it will show the MSB and use the decimal points to shows the number of missing 0s. 2 million cycles at 85°C and 1 million cycles at 125°C. let’s say 16 000 000 writes. Well if I have to guess I would guess 9 469 043, Now I am curious to see how close (or not) I got. I have read somewhere that tests like this one might show much higher cycle counts than would in normal use condition, as the power is not recycled between read/writes. so I wouldn’t be surprised if the cycles produced in this experiment is many folds higher. My guess is 11.7M cycles. 54,967,295 -> a random radioactive particle will cause an error… even better I think it will be an Alpha particle for some reason. /Assuming that it’s not set to roll over once it hits 10 mil. 9,999,999 if it can’t roll over. It will show decimal points and drop the least significant digits. “everything dies, but that’s OK”…. Hey Ian , please run it again ,this is more fun than the eurolotto !